Does your industry include workers who operate in highly demanding environments? For example, health care, construction, law enforcement, counseling and social work professions have both predictable and unpredictable threats, pressures, and circumstances that create high levels of cumulative stress. Increasingly, one unpredictable concern in a number of settings is the threat of violence. The highest number of injuries in U.S. workplaces related to violence are directed at health care and social assistance workers (Centers for Disease Control and Prevention, 2018), but industries like education, journalism and others have faced acts of violence in recent years as well. These acts may include an attack from a person who has a known violent history; attack from someone with no known history, such as a patient or family member; physical assault by a coworker; or a mass event, such as an active shooter or someone bringing an explosive device in one’s facility or community. More than ever, workplaces are providing protocols and training to reduce the likelihood that personnel will experience violence and are preparing workers in the event violence does occur. Such protocols and training will falter, however, without an understanding of basic neuroscience, resilience and effective leadership. In 2014, the U.S. Agency for International Development (USAID) commissioned Greenleaf Integrative to conduct a gap analysis study of stress exposure that its humanitarian workers face and to recommend ways to close gaps of vulnerability. We uncovered information that is applicable and valuable to many professions. USAID leads the U.S. government’s international development and disaster assistance, bringing relief and lifesaving assistance amidst complex crises in desperate and dangerous parts of the globe. Much like in other demanding environments, humanitarian aid requires rapid adaptation to change. Particularly after 9/11, humanitarian workers are required to wear body armor, to use military escorts and to comply with increased documentation requirements. The result is often hypervigilance among staff and increased distance between workers and the local community. Humanitarian workers frequently report that these conditions diminish the joy they feel in their work lives. Greenleaf was given access to interview and survey leaders and workers in USAID’s dispersed worksites across the world. The information gathered suggests that while people’s greatest fears for violence happened infrequently, workers were in constant anticipation of dangers related to their personal security, suffering frequent acute stress as well as cumulative stress. Workers were in a relentless hypervigilant state. Their sleep was often disturbed, they held negative expectations for the future and they had low levels of trust for their leaders. Following the gap analysis, Greenleaf developed recommendations for systemic organizational policy and practice changes, professional and leader development and stress mitigation and staff care programs in partnership with USAID leaders. Consultative work helped to reinforce a dual responsibility – workers need neuroscience-based and culture-specific skills that build greater resiliency, and organizations must commit to a diligent approach to maintain a resilient culture with appropriate policies, communications and behaviors. So what changes are needed at an organization if the threat of violence is real? A more methodical approach is a bare minimum requirement. Resiliency – developed and applied – is the difference between the theoretically safe and the actually safe workplace. We recommend an approach we call Greenleaf’s Awareness-Regulation-Leadership Resilience CompetenciesTM (ARL). If any one of these ARL Competencies is weak, then what you have is fragility or brittleness, which makes an organization vulnerable to violence’s more tragic and insidious outcomes. The table below illustrates the individual and organizational layers of these three competencies. Without support and resources, many individuals and organizations default to the fragile/brittle state. 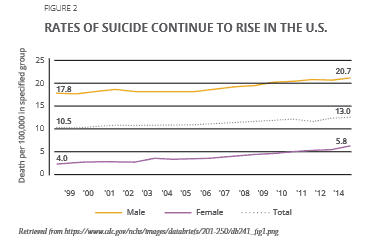 Media attention to the high and continually increasing rates of burnout among physicians and nurses, as well as recent announcements of the rise in suicides in the U.S. (see Figure 2), make resilience training all the more critical for workplaces. Workers who learn and are encouraged to practice strategies for reducing the effects of cumulative stress will not only be less likely to make errors, they will be more likely to remain calm and focused during critical incidents, to recover more quickly afterward and to model such skills to others. In our experience, people who serve in demanding environments often bring a sense of mission to their work, and they frequently develop a high level of competency in a variety of technical and professional skills. Over time, however, and with exposure to cumulative stressors and unexpected organizational strains, workers are prone to experiencing negative physiological and emotional effects, and their attendance, engagement and work performance often decline. Training such workers to hone resilience competencies of awareness, regulation and leadership is critical for helping to mitigate the hypervigilance and fears of violence that are common in demanding environments. When these resilience competencies become second nature and constantly operate in the background, they keep workers and community members safe and make workplaces more effective. Mental health in the workplace is critical. 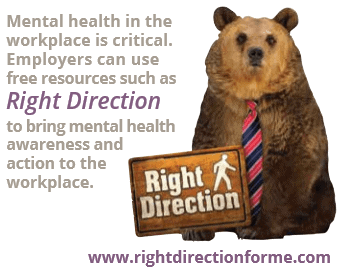 Employers can use free resources such as Right Direction to bring mental health awareness and action to the workplace. Briggs, L.R., Shah, S.A., et al. (2015). Stress and resilience issues affecting USAID personnel in high operational stress environments. Greenleaf Integrative study commissioned by USAID. Centers for Disease Control and Prevention (2018). Occupational Violence. 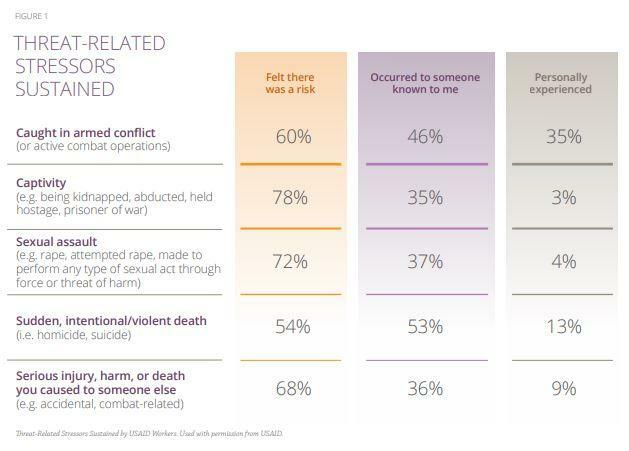 Retrieved from https://www.cdc.gov/niosh/topics/violence/fastfacts.html. Dyrbye, L. N., Shanafelt, T. D., Sinsky, C. A., Cipriano, P. F., Bhatt, J., Ommaya, A., … & Meyers, D. (2017). Burnout among health care professionals: A call to explore and address this underrecognized threat to safe, high-quality care. NAM (National Academy of Medicine) Perspective. Letvak, S. A., Ruhm, C. J., & Gupta, S. N. (2012). Nurses’ presenteeism and its effects on self-reported quality of care and costs. AJN The American Journal of Nursing, 112(2), 30-38. Shanafelt, T. D., Hasan, O., Dyrbye, L. N., Sinsky, C., Satele, D., Sloan, J., & West, C. P. (2015, December). Changes in burnout and satisfaction with work-life balance in physicians and the general US working population between 2011 and 2014. In Mayo Clinic Proceedings (Vol. 90, No. 12, pp. 1600-1613). Elsevier.